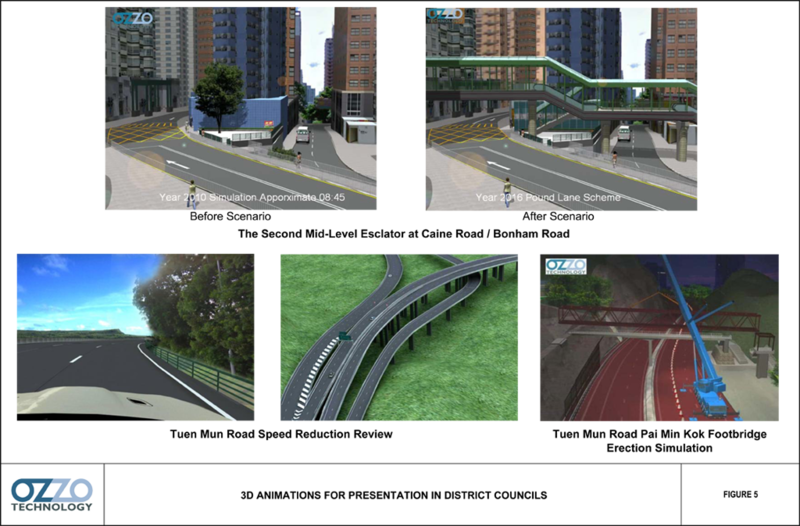 Ozzo Technology (HK) Limited, founded in 2007, is a research and developmental-based traffic consultant, providing new insights into transportation. By using advanced technology to resolve traffic problems, enhance cost-effectiveness and increase productivity, Ozzo has been expanding rapidly and successfully. Ozzo’s capability reaches into many different areas. Ozzo’s experienced staff and IT partners, both local and overseas, work together closely to handle a multitude of traffic-related projects. Unlike traditional traffic consultants who are bound by stand-alone computers, Ozzo provides multiple access to its systems. 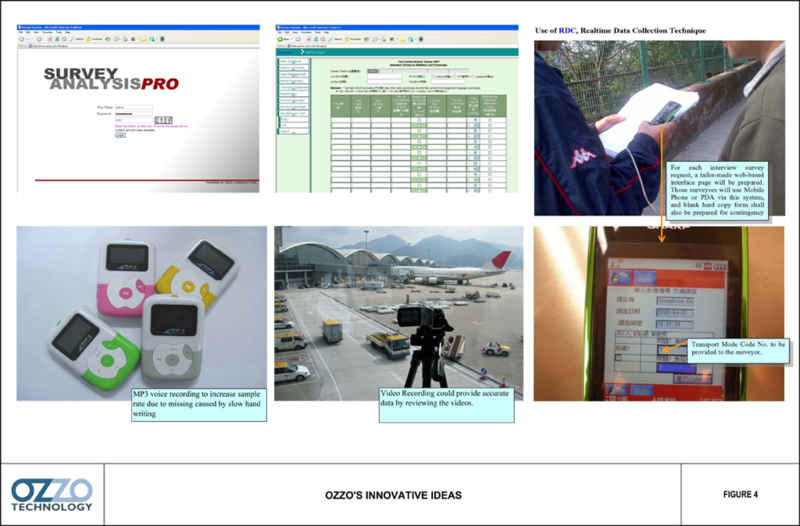 By using web-based systems, it can produce timely solutions to planning and modelling as well as to engineering. Why Ozzo Technology? “Technology” revealed that we not only deliver traditional traffic consultancy services but also introduce new technologies for problem solving so as to improve both productivity and quality. Our strategy is to provide new insights to the market of traffic and transportation to generate new opportunities. Ozzo Technology (HK) Limited, called “Ozzo” hereafter, newly established in 2007, offering transport, traffic and logistics consultancy services. Ozzo provides planning, engineering, modelling and due diligence study supporting by our experienced team members, who have worked on different projects such as road works, water works, drainage works, slope protection works, buildings, railways, ports, airports and expressways. The professional expertise within the Ozzo consists by experienced project manager, economist, transport modeller, civil and traffic engineers to manage and undertake traffic, transport and logistics projects. Ozzo also invests significantly in research and development such as Web-based Traffic Modelling and Web-based GIS application. 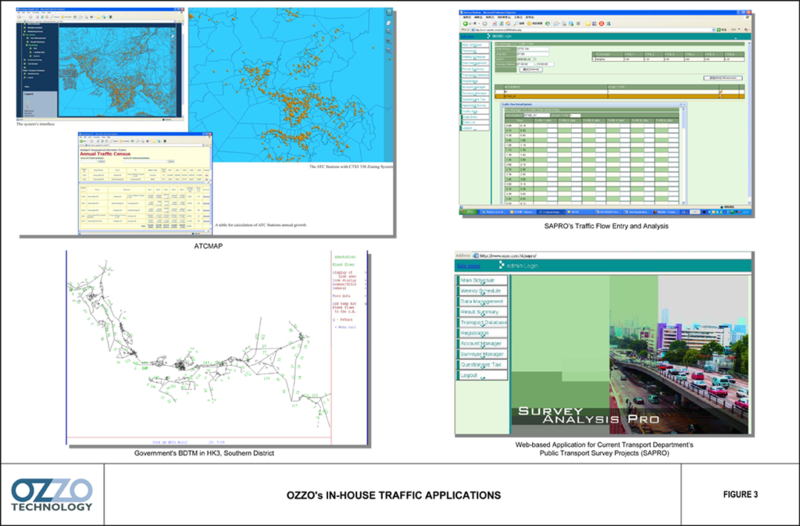 Details of Ozzo’s traffic and transportation projects are shown in the following page with geographical presentation in Figure 1.1-1.2 and Figure 2.1-2.10, meanwhile Ozzo’s in-house systems are shown in Figure 3. Meanwhile, Figure 4 presents Ozzo’s innovative methodology in problem solving and Figure 5 shows some 3D animations prepared for presentation in District Councils’ meetings. To support transport department public transport survey projects. A Web-based GIS summarising Transport Department’s Annual Traffic Census Data provided in the website. A Web-based GIS to summarize the temporary traffic management schemes proposed by the contractors.